Even though new applications and online shopping sites no longer offer Taobao as the only tool for purchases, it still remains one of the most preferential for online purchases. Just think about the success Taobao has each year with 11.11 (双11, “double 11”), which isn’t just a party for singles, but also a chance to give free reign to your shopping desires and make purchases. The figures expended these days make one’s head spin: in the first two minutes after midnight this November 11, 2017, a billion dollars were already spent, to then surpass 25 billion by the end of the day. If you too want to enter the world of online shopping but the language barrier blocks your access, this guide is for you, showing step by step how to make purchases on this platform, even if you have very little knowledge of the Chinese language. This guide isn’t designed to be a complete manual on the use of Taobao, but rather guidelines for using it on a mobile device for the foreign user living in China who doesn’t speak Chinese. 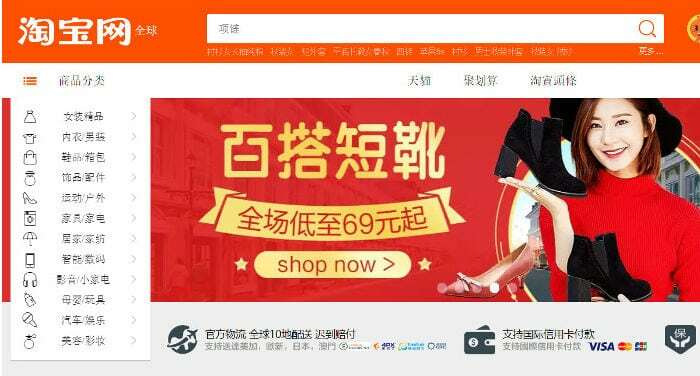 First let’s uncover what Taobao is (淘宝网, Táobǎo Wǎng, ovvero “Network for searching treasures”, here you’ll find the official site) it’s a Chinese internet site for online shopping, under the control of the Alibaba group, which is its owner and founder. Taobao is a platform where vendors and consumers meet, a little like eBay: on Taobao you can find online shops (lots of small privately-run businesses) where you can buy all sorts of merchandise, because on Taobao there’s truly no limit to the imagination. Think about what you need, enter it into the search engine and wait a few seconds to get the desired results because anything that doesn’t exist on Taobao, is truly rare merchandise and it’s rare to not find the searched for product. Since this is a guide for using the application on a mobile device, the first step to overcome is installing the application on your cell phone or tablet. To install Taobao just search for it in one of the application stores (Google Play for example), by typing in the name. The full name of the cell phone application is “手机淘宝”， or “taobao for cell phones”, and is easily recognizable because it is represented by an orange icon with the character “淘” in white inside. After downloading the application, choose the icon. In order to use the application you’ll be asked to give a few permissions to continue on. The opening page you’ll see is the home page, where you can start searching for your favorite products. To register you’ll have to access the personal section, clocking on the last icon on the lower right “我的淘宝” (“My Taobao”), represented by a little cartoon man. Here you can move on to the registration by choosing the heading “新用户注册”, (“new user registration”). The first heading you see on the screen will first ask you to enter the name of your country “国家地区”, to them match the prefix of your telephone number. If you use a Chinese sim you’ll then have to choose 中国大陆, China (+86). At this point you’ll be sent a text message at a number entered by you with a verification code to be entered within a minute. Do it and choose the only heading “下一步”, that is “next step”. Next to the heading “登录密码” (“register password”) you’ll have to enter a new password of 6-20 alphanumeric characters, while next to the heading “会员名” you can choose your user name, which will be visible on the platform. As Taobao recommends in its note, avoid entering private information here. Confirm with “确定”. At this point you’ll see writing that says “注册成功”, which confirms that you have registered successfully. Registering with Taobao and adding an address are the most complicated phases of using the application. So if you’ve gotten up to this point, you’re already doing well! On the lower right of the Taobao home page, there’s the usual icon of a person’s face, remember that it’s the personal section on the platform with your user name and personal information. Adding an address is fundamental for buying products and later receiving them, so make sure that it’s accurate. So press on the little cartoon man icon, and on the next page press on the characters on the upper left “设置”, (“settings”). The first heading that appears on the white screen is “我的收货地址” (“receiving address”) and add a position by selecting “添加新地址” (“add new address”) in the orange section below. The recipient: here you’ll enter the name of the person that will receive the ordered items. Indicatively, if you’re using your account you’ll have to use your name. Telephone contact. Enter the telephone number to be contacted about the arrival pf packages or any other eventuality. Here you’ll need to enter first the region, then city and district you’re in. Remember that in this section and the two that follow, you’ll have to enter everything in Chinese characters. If you’re unable to do so on your own, you’ll have to ask someone to do it for you. In any event you’ll only have to enter this information once, during your first use. Later that information will remain saved. Lastly enter a detailed address with all the information you have. Now that your account is ready, you can start shopping! First you’ll have to start by searching for what you like and what you’d like to buy. How do you do so? Searching on the home page won’t be particularly useful if have something specific in mind that you’d like to buy. Instead, from here you can look at the general trends and objects similar to previous searches. You can then scroll through the page, taking a peek at objects you like and by clicking on them you’ll be directly sent to the store’s page. If you already have a specific item in mind, the best option for your search is to directly enter the term in the search engine. Often, by entering the name in English you’ll be able to find a few results, but if you want a greater selection, I recommend you also do a search for Chinese terms. To find the Chinese term that corresponds to the product you want, you can use one of the many apps or dictionaries for that purpose. When you open the Taobao application, on the first screen you’ll see an orange bar in which you can write: type in the name of the product you’re interested in and press the search bar to see the results. Have your friends showed you something that you can’t do without but you don’t know it’s name? Don’t be afraid, you can just take a picture of it to enter into the Taobao search engine. Still in the search bar at the top of the initial screen, there’s an icon of camera. Click here and you can choose to take a picture in that moment, or choose from an album on your phone by choosing the icon on the left with the image of a photo gallery. Take or select a photo and move on! You’ll start a search where the results will correspond as much as possible to the image you sent. Imagine now that a friend wants to share, on Wechat for example, the link to a product you’d like to by on Taobao, here’s how to find it. Copy the link that was shared with you and open Taobao. The application will automatically recognize that you’ve already copied a link for Taobao, and you’ll see a window appear that will ask if you want to see the page from the copied link. If this is your intention, click on the option to the right “立即查看” (“see right away”), otherwise ignore it by clicking on the button on the right. If you’re reading this guide you won’t be able to read the reviews left by users that have bought the product you’re looking at before you, but all the same there are a few tips that could help you figure out the product’s quality. Once you open the page of the article you’re interested in, scroll to the bottom until you find the review section, “宝贝评价”. Here you’ll see how many reviews the product has already gotten. These are generally the words associated with the quality or type of service and correspond respectively to “good”” (好), “not bad” (不错), “normal”/”so-so” (一般) and “no good” (不好). These are words that can be associated with the qualitative adjectives just mentioned: “service” (服务), “quality” (质量), “flavor” (味道). Let’s see a practical example: if you see the heading “宝贝评价” (2560), it means that the product has received a total of 2560 reviews. If, immediately below, you’ll see the writing “质量好” (2015), which means that there are 2015 reviews saying it is of good quality. Often the speed of shipping is reviewed (发货) which can generally be “快”， “fast” or “慢”, “slow”. These are just a few examples of words that you can find in reviews, but each product has different reviews with different words. After taking a look at the product’s general reviews, by selecting the heading “查看全部评价” (“see all reviews”) you can see all full reviews, including ratings and photos. Seeing user photographs could be useful in determining if the product meets your expectations. Once you’ve opened the product page you’ll see at the bottom left of the screen, as a fixed icon, a white cloud with two eyes and a blue border. After pressing it, it will open a direct chat with the vendor, which will show the product you want to discuss. From here you can write or even send images or video. Usually the vendor won’t speak English, but they might have the patience to try or even use a translator to communicate with you. Otherwise you’ll have to find a way to communicate in Chinese. This chat section with the store can be useful not only in the purchasing phase, but also during any eventual returns if you want to return or exchange the product. After choosing the product from its page, it’s now time to pass to purchase and payment. And spending money has never been so speedy! What if you like a product, you’re thinking about buying it, but don’t want to do so right away? Or you still want to keep shopping and make just one payment? Like every other shopping application, Taobao allows you to add products to a cart and decide later on what you want to do. To add a product to your cart, choose the heading in orange in the fixed bar on the product page, “加入购物车” (“add to cart”). In some cases, the product will simply be put into your cart while in others you’ll be asked to choose the type of product, its color, size style and other things. Though some stores change the image according to your selection so you can see exactly which model corresponds to your choice, others show only one image for the various choices you can choose from. In this case, dictionary in hand, proceed to the translation. After making your choice, press the red button at the bottom of the page, “确定” to confirm your choice. The item is now in your cart. To buy a product, you can choice to skip the phase of adding to your cart, and go right to payment (or do so from your cart by clicking on the corresponding icon and following the steps to follow). To do this from the product page, choose the option at the bottom of the page in the fixed bar “立即购买”. Even here, as with adding to your cart, you could be asked to choose the type of product you want to buy. After doing so, press the button “确定” to confirm. It will bring you to a page with your address at the top of the page and the product right below it. At this point, if there aren’t any errors you can send your online order by selecting “提交订单”. Clearly, to go to purchase products you’ll have to choose a method of payment, and that’s our next step. Taobao’s recommended app for payments is Zhifubao (a payment platform also launched by Alibaba). Remember that this is a guide for using Taobao, so to use Zhifubao, I recommend that you look for a specific guide. In any case, to go on to payment you’ll have to associate a credit card to your account. If you’ve already connected your Taobao account with a Zhifubao account, a screen will open with the price, from which you can choice the heading below “确认付款” to confirm payment. After selecting it, enter the 6 digit password you entered when creating your Zhifubao account. Without needing any other confirmation, your product is now paid for and is being prepared by the store to be sent to the destination you’ve indicated when choosing the shipping address. If you still haven’t connected your Zhifubao account to your Taobao account, you’ll see the white and blue screen of Zhifubao appear, which will direct you to supply a bank card to proceed onto payment “添加银行卡付款”. Choosing this you’ll be sent to a page where you can enter your bank card number, “卡号”, and on the next page enter your personal data before going on to payment. Personally, I recommend that you sign in to Zhifubao with your account in the section “我的淘宝”, “my Taobao” (on the bottom right of the main screen, the little man icon), “设置”, “settings” (top left), “账户与安全”, “account and security”, “我的支付宝”, my Zhifubao. From here, in the section “银行卡”, “bank card”, you can add one or more cards for payment on Taobao. Choosing this heading, you’ll be directed to download the Zhifubao app. For more information on Zhifubao, I recommend you look for a dedicated guide or ask advice from those familiar with this application. This operation only needs to be done once and will later allow you to use Taobao with saved information in Zhifubao, without having to enter it every time. After buying a product you have to wait for delivery. While you’re waiting for your package, you can check its movements on your Kuaidi. You can do so from your personal section via the person icon at the bottom right of the first page, and choose the little truck from the five icons above. Here you can see the products en route (if you don’t see your it means that it still hasn’t been sent). Choose “查看物流” to see the route your package is traveling and see in which city it can be found. This section isn’t all that useful if you don’t know the names of the cities, but it could be should you realize your package is late and you want to check why you haven’t received a notice of its arrival, if it has arrived at your city, or what has happened to it. To receive your kuaidi, delivery will depend on the address you entered. If you live at a university, generally your package won’t go directly to your room or apartment, but to the shipping company’s office (or “kuaidi”, “快递”) chosen by the store. In general, once received, the kuaidi office will call or send a text message to let you know at which office near the university you can pick up your package along with its number. All students know where to pick up their kuaidi, so finding the office will be simple. Give them your number and pick up your package. If, instead, you give your apartment or office number, the kuaidi could be sent directly to your door or a pick-up point depending on the place. You’ll be alerted (which is why it’s so important that the data you entered is correct) or alternatively, you could check its location from your shipping page (little truck icon) on Taobao. Once you enter the data, buying things online becomes really easy, quick (generally in about 3 days you can get items) and simple. For those who don’t have the time or desire to go shopping, Taobao is a great option, doing everything from the comfort of your phone you can get the items you need, anything from clothes, groceries or household cleaning products, gifts, knick-knacks, and, the more one has, the more there is! But being able to buy things from home, laziness takes over and we find different reasons to not go out and wind up spending increasingly more time at home, thereby limiting their human contact. It also becomes really easy to spend money uncontrollably with just a simple click! So place limits on yourself if you don’t want to be submerged by products without a cent in your pocket! Moreover, it’s often necessary to be mindful about the quality since, not being able to see or touch the items before buying them, you might be in for a big surprise on its arrival: a different cut than expected or inferior quality than advertised. However by opening the product’s specific page, scrolling the images until the last photo, you’ll have greater information on sizes and materials used. Giorgia arrived in China in 2013, after graduating in Foreign Languages and Culture. She loves traveling, writing and cooking. At the moment she lives in Taiyuan, in Shanxi Province.